Kernel failures, crashes, panics and oopses? Do these sound familiar to you? 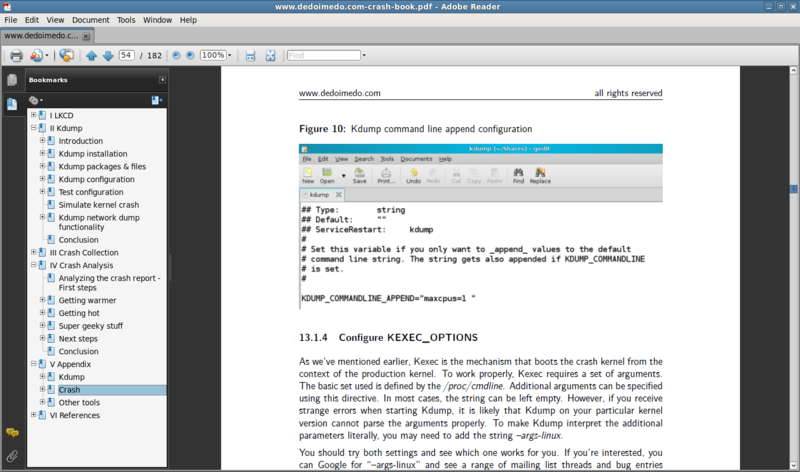 If not you may want to read dedoimedo’s Linux Kernel Crash Book. It is a step-by-step guide to introduce you to kernel crashes and crash analysis, written with simplicity in mind, accessible even to Linux beginners. compile a kernel module and use it to create a kernel panic. When your kernel crashes, you may want to take the initiative and submit the report to the vendor, so that they may examine it and possibly fix a bug. This is a very important thing. You will not only be helping yourself but possibly everyone using Linux anywhere. What more, kernel crashes are valuable. If there’s a bug somewhere, the developers will find it and fix it. You can get the book from dedoimedo.com.